Sarah Woodson is the T.C. Jenkins Professor of Biophysics at Johns Hopkins University. 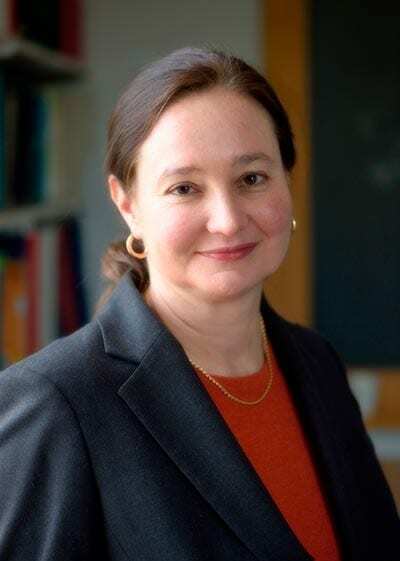 She received her PhD in Biophysical Chemistry in 1987 with Donald Crothers at Yale University, and did postdoctoral research in the laboratory of Thomas Cech at the University of Colorado Boulder from 1987-1990. Her research group studies how RNA molecules fold into specific three-dimensional structures, and how the RNA and proteins components of cellular complexes such as the ribosome come together. In addition to biophysical methods such as X-ray scattering and single-molecule fluorescence, her group has pioneered the application of X-ray hydroxyl radical footprinting to RNA. Dr. Woodson received a Pew Scholar Award in the Biomedical Sciences in 1993, a Camille Dreyfus Teacher-Scholar Award in 1995, was elected an AAAS Fellow in 2010 and the President of the RNA Society (2016-2017). Discoveries of non-coding RNAs have exploded in recent years, changing our ideas on how genetic information is interpreted in the cell. The Woodson lab studies how non-coding RNAs fold into specific three-dimensional structures and how RNAs and proteins come together to create cellular catalysts, machines, switches, and sensors. The physical process of RNA folding is important for the evolution of living systems, for viral and bacterial disease, and for learning how environmental stress and aging alter RNA complexes such as the ribosome. RNA folding and dynamics. RNA catalysts (ribozymes) are wonderful systems in which to study the RNA folding problem, because the activity of the native RNA is easy to measure. One surprise is that a small number of RNA sequence motifs specify how an RNA folds. By following the folding pathway of a bacterial ribozyme with small angle X-ray scattering and single molecule fluorescence spectroscopy, we found that tertiary interactions between RNA double helices cooperatively reinforce each other when the helices are aligned correctly. This makes the correct RNA structure more stable than alternative structures. We are currently investigating how conditions inside the cell alter the way the RNA folds and how new structures arise as the RNA sequence evolves. Ribosome assembly. Ribosomes are large RNA-protein complexes that synthesize new proteins in cells. Stress or genetic mutations can cause cells to produce too few ribosomes, or ribosomes that don’t function properly. In collaboration with Taekjip Ha (Johns Hopkins), we are using single molecule fluorescence spectroscopy to visualize the motions of single RNA-protein complexes. From this, we are learning how proteins change the RNA structure, ensuring that the proteins and RNA come together in the proper order. We are also using an X-ray footprinting method to take “snapshots” of the ribosomal RNA as it assembles inside cells. The results help us understand how cellular proteins chaperone ribosome assembly and how the structure of the ribosome changes under stress. Small non-coding RNAs and Hfq. Bacteria encode hundreds of small, non-coding RNAs (sRNA) that control the activity of downstream genes. Many sRNAs act by base pairing with a target messenger RNA, decreasing or increasing translation of the target gene. We use biophysical methods to study how an RNA chaperone protein called Hfq helps bring sRNAs together with their targets. In collaboration with Susan Gottesman at the NIH, we are studying how Hfq affects genetic regulation by sRNAs in E. coli. Panja, S., Hua, B., Zegarra, D., Ha, T., Woodson SA. (2017) Metals induce transient folding and activation of the twister ribozyme. Nat. Chem. Biol.13, 1109-1114. doi: 10.1038/nchembio.2459. Behrouzi, R., J.D. Kilburn, J.H. Roh, R.M. Briber, and Woodson, S.A. (2012) Cooperative tertiary interactions network guides RNA folding. Cell149: 348-357. Hulscher, R. M., Bohon, J., Rappé, M. C., Gupta, S., D’Mello, R., Sullivan, M., Ralston, C. Y., Chance, M. R., Woodson, S. A. (2016) Probing the structure of ribosome assembly intermediates in vivousing DMS and hydroxyl radical footprinting. Methods 103: 49-56. doi: 10.1016/j.ymeth.2016.03.012. Kim H., Abeysirigunawardena, S., Ranganathan, K., Chen, K., Luthey-Schulten, Z. A., Ha, T., Woodson, S. A. (2014) Protein-guided RNA dynamics during ribosome assembly. Nature506, 334-338.